We all know how challenging and difficult (re)connecting with Mother Nature can be today, as most of us are not lucky enough to live and work in a place that is not completely transformed by men. Yes, few are the people who are not greeted by the cold stare of tall concrete buildings on a daily basis. Unfortunately, things are not much better in our houses and apartments, since many of us have transformed our family nests into rather heartless contemporary residences, forgetting or choosing not to incorporate an element or two in our homes that will remind us of the fact that we too are a part of nature. I know, I know, I am being too emotional. Not all hope is lost yet, for the world is full of passionate Nature Lovers who truly enjoy growing all kinds of fruits and vegetables both indoors (with the help of indoor modern planters) and in their own urban gardens. Such people are constantly looking for new ways to express their admiration and affection towards our home planet. Now, aren’t they a wonderful source of inspiration? Yes. Yes, they are. If you are one of these amazing individuals, then I believe that it’s safe to assume that you have grown tired of looking at your lifeless walls every single day of your life, which can only mean one thing: the time for change has finally come. You no longer have to bear the boring sight of your plain white walls; with the aid of a tasteful modern or retro floral patterned wallpaper (the choice is entirely up to you), you can easily turn them into a stunning work of art. Can you imagine how soothing waking up in a room the walls of which are covered with prints of your favourite flower must be? 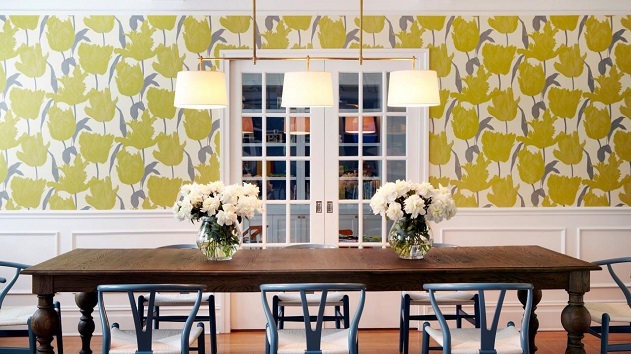 Can you think of a warmer and more inviting dining room than one with lively nature-inspired wallpapers? Of course you can’t. That’s exactly why you are so tempted to look for the right Floral Patterned Wallpaper for you and buy it right away. However, before you start your search, I would like to advise you to make sure that the wallpapers you decide to purchase for one or several of your rooms can complement their décor without stealing all of the attention. Remember: they are an addition to a room, but never its focal point. Oh, another thing you should take into consideration when shopping for this type of wall coverings is the material they are made of. Yes, solid sheet vinyl wallpapers are perhaps the most luxurious and the most durable ones, but non-woven and paper wallpapers are the most eco-friendly wall coverings out there. The existence of all of these options suggests that you shouldn’t make any hasty decisions. The post Nature Lovers, Learn Why Floral Wallpapers Are Ideal for You appeared first on The Ideal.